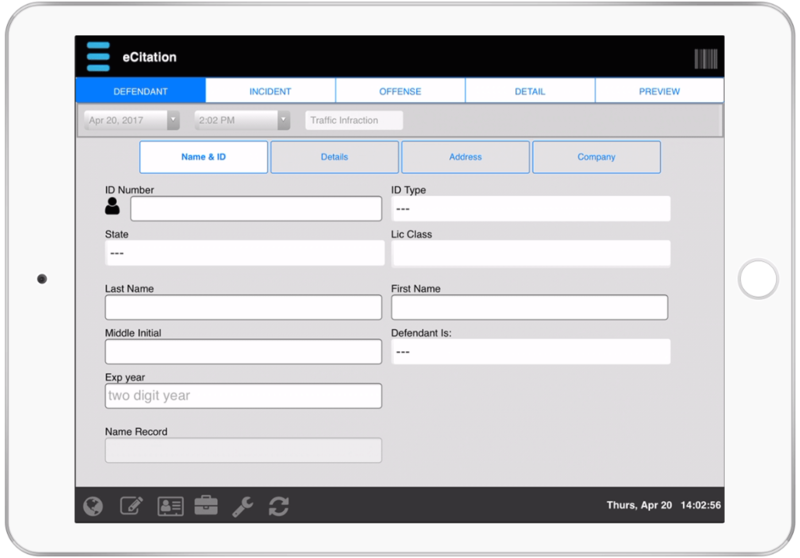 Our system provides an integrated solution for creating eCitations within JusticeConnect apps. Automatic lookup of driver and plate data from RMS and ForseCom LEDs. Automatic form filling of citation from Barcode /RMS/ DMV data. Choose selectable offense codes from drop-down menus. Selectable assignment of court date based on pre-specified rules. Citation data transmitted automatically to CMI RMS system. Offline-Mode for creation of Citations in cellular data dead-zones. Ability to reprint citations from the app or web-based administration console. Customizable reports from Administration Console. Metrics Reporting based per-officer or agency with time-frame histogram mapping. Contact us to schedule an online DEMO or for a full integration proposal including licencing, training and printer hardware.